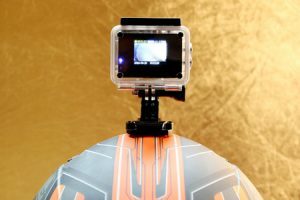 While utilising helmet cams can provide the inherent fun of watching and editing your own rides, there are a variety of practical uses to having the footage as well. The footage recorded through the use of a camera while cycling can be helpful in improving your abilities, it can assist you in familiarising yourself with new terrain, and it can also be used to record footage during an accident or incident that occurs while riding. With the many potential advantages for using a helmet cam while cycling, there is limited downside to owning and using a camera while riding. It can be difficult to share the road with motorists, and bicyclists can often be the victims of near misses, incidents of road rage, or full blown accidents. Often accidents are unintentional, but the footage from the helmet cam can help settle any issues of liability. If aggression and dangerous driving is intentional, the available footage could be very useful in protecting you and potentially persecuting the individual responsible. The footage from your camera can actually be used as hard evidence should any charges be brought up or court proceeding be necessary. If for any reason you feel that you are threatened or in danger, the camera can serve as an added means of protection and peace of mind that it won’t be your words against someone else’s. The footage you record can also be useful should you receive any fines or tickets while you are cycling. Since cyclists can be held liable for not obeying the laws of the roadway, and also face other potential fines such as cycling on a footpath, you may want to have footage on record to defend any argument you might have in contesting the fine. The footage you record can help defend your position should you be disobeying the law in order to remain safe, for example if you are required to ride on the footpath due to obstacles or danger in the road itself. Utilising the footage from your helmet cam can also help you improve you riding technique and memorise the features of any particular terrain. By viewing the footage and critiquing your ride, you are able to improve the way in which you approach cycling and the way you handle the terrain in front of you. The information you will learn from reviewing your cycling sessions may be otherwise unavailable to you. Over time this process will help you make adjustments that you might not have otherwise been aware of and help you continue improving your level of cycling. This strategy is common in many sports, and can certainly provide a variety of benefits towards improving you cycling skills as well. The simple presence of a camera can help to discourage poor behaviour by drivers and other people you might encounter while cycling. Whether the camera discourages the few people who intentionally endanger cyclists from threatening you, or encourages positive behaviour and keeps temper in check should an accidental incident occur. The accumulation of evidence and footage of poor behaviour of people on roadways can help to underline the importance of addressing the issue of cyclist safety on a larger scale. Videos can go viral on the Internet and bring unwanted attention to individuals who are caught behaving badly. This is of course not the most ideal way to manage any issues that might arise, but having the obvious presence of a recording device may help maintain civility in moments where emotions and tempers could otherwise get out of control. If you are getting familiar with new terrain it can be helpful to have a video of the first time you rode it, which can familiarise you to the specifics of the new route quickly. This can be very important and useful if you are utilising your cam while mountain biking, where the terrain can sometimes be unpredictable. By reviewing the route on video you can memorise the course or trail and then begin to visualise how you will approach the ride. Of course, one of the greatest advantages of having a camera while cycling can be the reminders of those memorable rides and beautiful landscapes. You can collect footage of the most difficult, or the most breathtaking views you’ve had while riding. Whether you happened to be cycling through rolling hills during a sunset, or your travelling past historical sites while riding, the footage collected can end up as souvenirs of your experience. The technological advancements and miniaturisation of video recording materials has made the availability of cameras designed for cycling increase in the past few years. There are now cameras available for most budgets and ones where the quality of the footage they produce are very high quality. With the many potential advantages to using a camera while cycling, there is very limited downside to purchasing one for yourself.